Regular Tarot Bags - People Regular Tarot Bag - Tarot Bags, Tarot Cards, Cloths, & More! Faces young, faces old, expressions serious, expressions amused. This unique print represents humanity in general. These people could be at a parade, festival, sports event, or shopping mall opening. They represent you and they represent me. 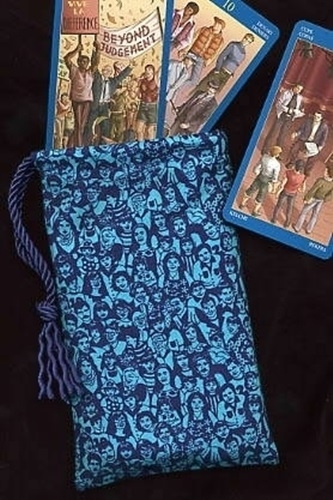 The fabric for this tarot bag is truly unique. There are couples and families too. Certainly, this pictorial bag is ripe for interpretation. Size: Regular, fits decks of 3 x 5 inches or smaller. Cord is dark blue.